Did you need to pick up a T-pass? Need to drop off paperwork for SGA? Have a question about your internship? 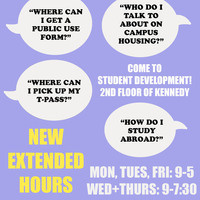 Stop by the Student Development Office during our extended office hours!